make any day "NUTELLA DAY"
these are such a hit and so easy to make. 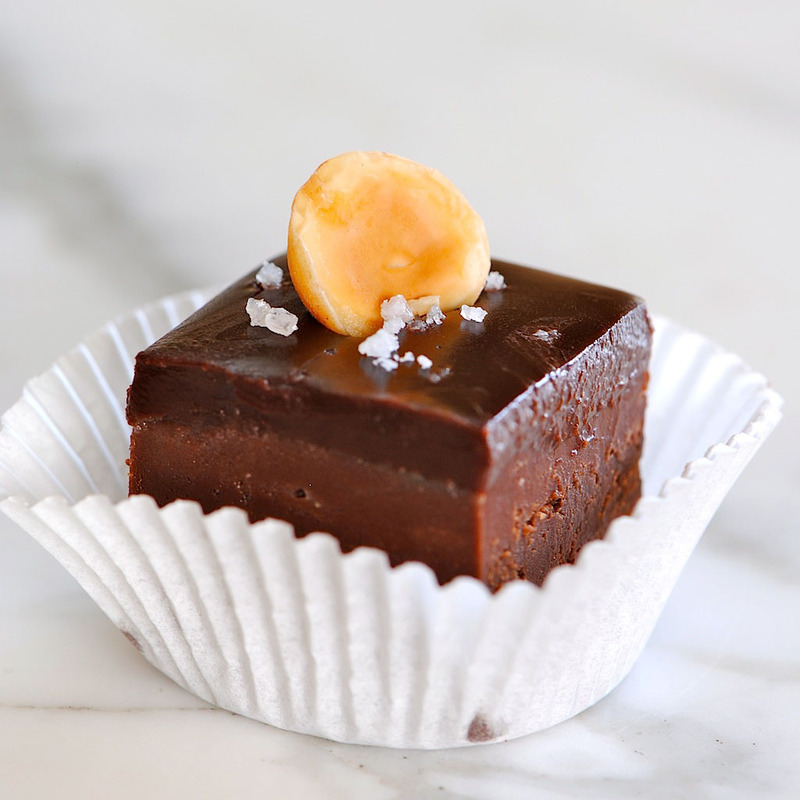 i've made this kind of quick and easy fudge before, BUT never with Nutella. i must say...the Nutella sends it right over the edge. AND smothered with more chocolate? the fudge by itself was unbelievable. so if you want to just whip this up by itself...do it now! you won't be sorry. i just thought i would pretty it up a little with a smothering of dark chocolate ganache and a little roasted hazelnut. 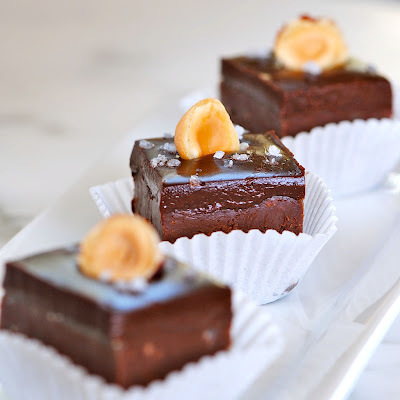 oh so very happy to find this recipe on Foodgawker a while back at Cake Duchess who adapted the recipe from Cookin' Canuck who , in turn, adapted it from a Giada De Laurentiis recipe...i'm out of breath... don't ya just love sharing recipes and seeing them evolve? 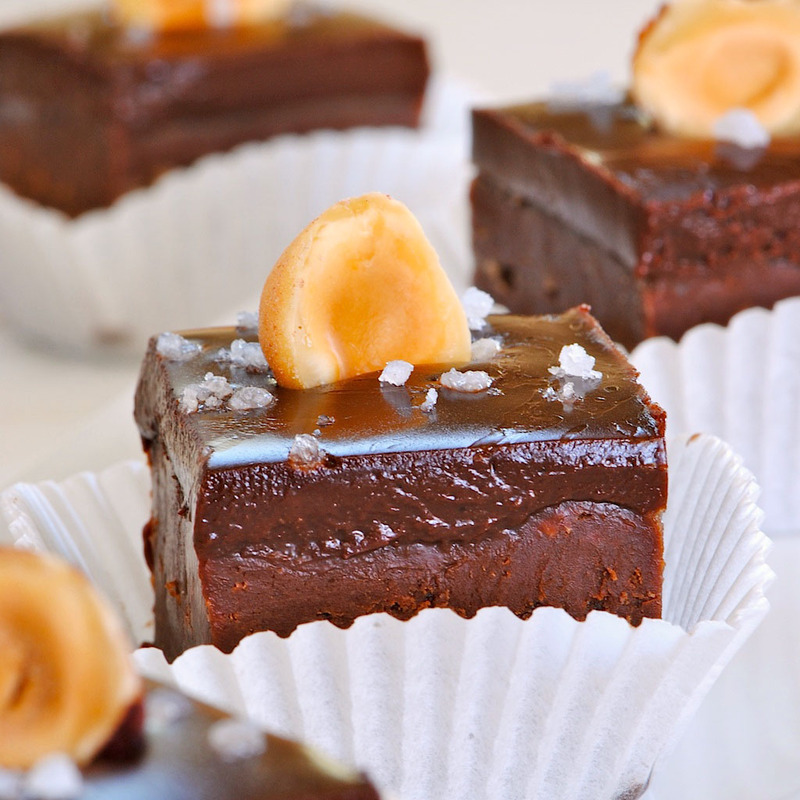 i noticed it was the same easy fudge instructions i had used before, only this used Nutella and peanut butter...sounds even better. quite a while ago i made "The Easiest Truffles Ever" . this basic fudge recipe is nice because you are guaranteed a smooth fudge, no worries about any sugar crystallizing and it's pretty effortless to throw together. please DO give it a try, and put your own twist on it...see what you come up with. of course, the first thing that comes to my mind is BACON !!! grease the bottom and sides of 8 x8 pan with butter. line with parchment, leaving a 2 inch over hang on both sides for easy removal. in double boiler combine the sweetened condensed milk, vanilla, chocolate, nutella, peanut butter and butter. 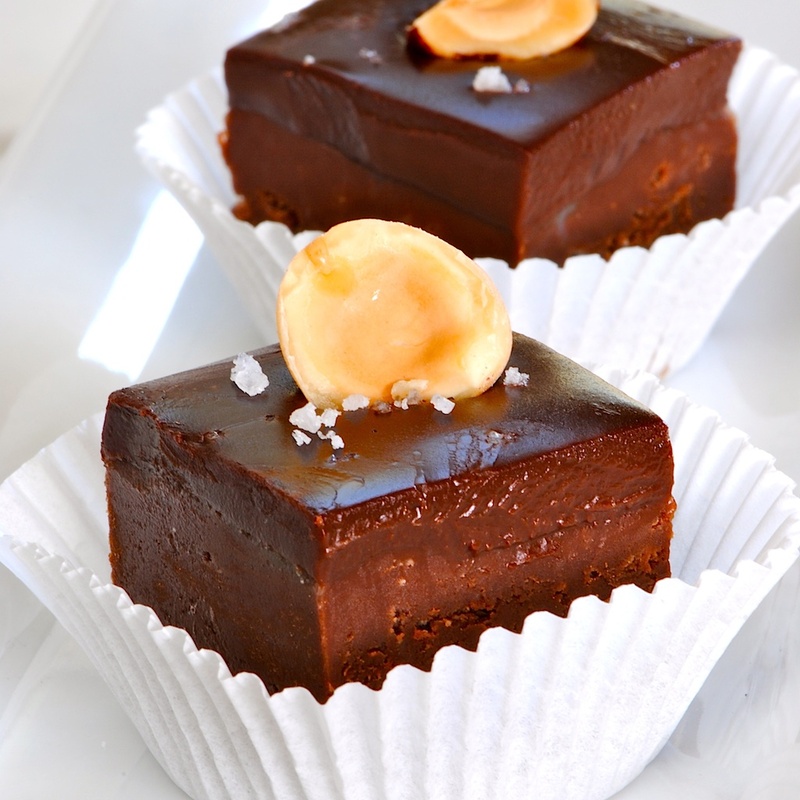 if you choose to smother with yummy ganache...wait until fudge is completely cooled. OR just eaten with a spoon !!! NOTE...I USED A LITTLE EXTRA SALT FOR THE PICTURE. don't over do it. omg, that sounds and looks like heaven! This is definitely something i'll try out! wow! You have me drooling right now! looks AMAZING! I'm making it tomorrow afternoon. Thanks for the great post. I wasn't prepared to bump into your photo !! I almost started to cry while my heart got crazy !! THIS IS PERFECTION !!! hey !! !...THANKS EVERYBODY for your fabulous comments. i hope you all are having a great day and a delicious nibble of something somewhere. hope to hear from you again. Question: are the ingredients for the ganache included in the first list? or are they additional?